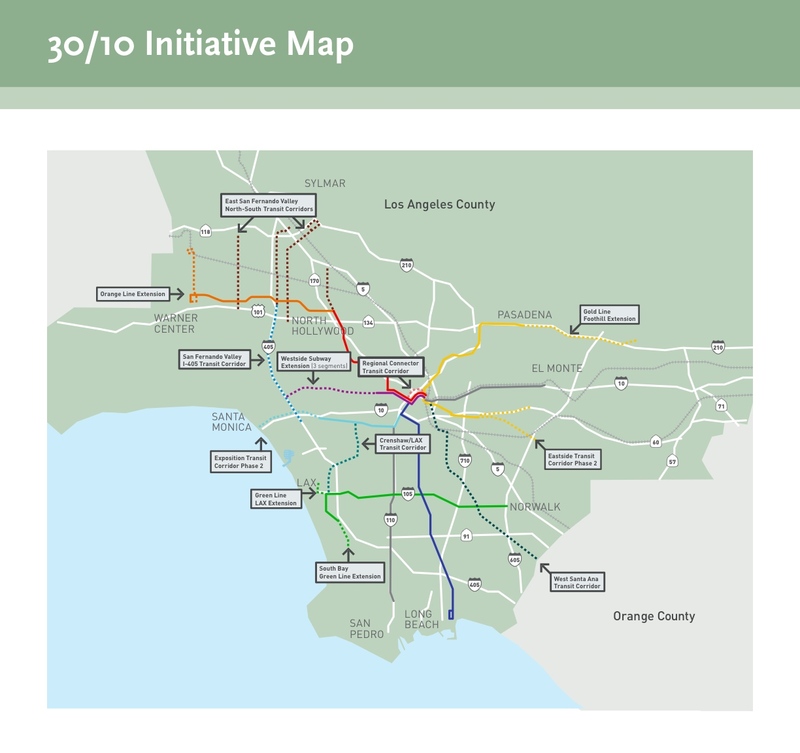 Measure R projects that would receive funding under the 30/10 Initiative. Click to see a larger image. Former L.A. Weekly writer Harold Meyerson has an op-ed supporting the 30/10 Initiative in this morning’s L.A. Times. Meyerson, long known as an advocate for labor, had a similar piece earlier this year in the Washington Post, where he is now a columnist. Attentive readers already know that the 30/10 plan would use federal loans and other financing to attempt to build Measure R transit projects in the next 10 years instead of the next 30. Coalitions this broad occasionally are assembled, but it usually takes something like a war with the Nazis to put them together. It’s a testament to how many of L.A.’s needs the 30/10 project meets that so many disparate groups and individuals support it. At a time when federal investment in the nation’s future is blocked by deficit demagogy, the feds should at least help localities that have committed their own funds to building for tomorrow, and to doing something that nobody else is doing: creating jobs. Meyerson’s op-ed is obviously deliberately timed to coincide with a rally by transportation and labor advocates for 30/10 scheduled for this Friday at noon on the south lawn of Los Angeles City Hall in downtown. Sen. Barbara Boxer announced yesterday that she will be among the supporters present. One important note about Meyerson’s column: While Mayor Villaraigosa certainly did conceive of the 30/10 plan and has strongly advocated for it, the Board of Directors of Metro this spring adopted it as the agency’s official policy. Other Board members and Metro staff have been lobbying federal officials, too. I also think it’s worth noting that everyone has their work cut out for them: only half of the county’s Congressional delegation recently signed a letter in support of 30/10 and those who didn’t support it came from both sides of the aisle, by the way.